^Propably It will be too expensive. Some facts regarding Sgt. 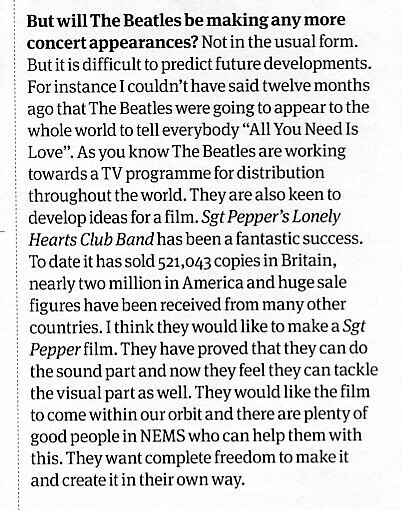 Pepper release date in the UK. That's no. 26 in the singles chart. Brian05 posts the evidence Edu won't or can't. So perhaps one could make a case for both dates being correct. Officially Thursday 1st June, unofficially in limited amounts a week previous in some areas. I have a figure of 16,000 the first week and 225,000 sales (shipments) to Friday 9th June. And for fun - FA Cup Final Spurs 2, Chelsea 1. From DISC magazine dated Saturday May 27th but came out on the Thursday. 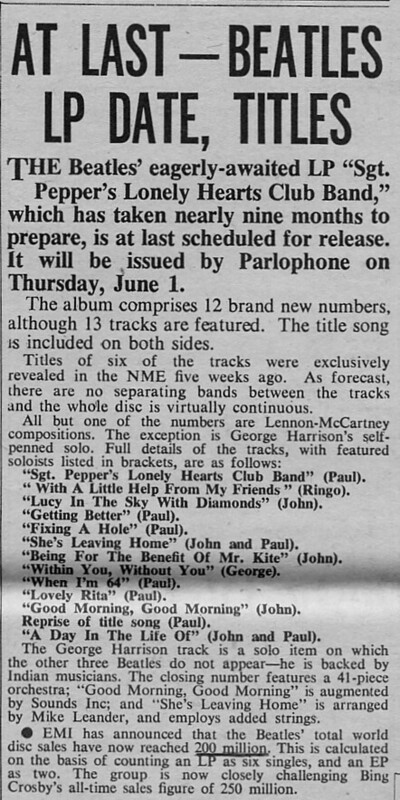 So a rush release date of Friday 26th May 1967. Hence the 50th anniversary edition is coming out exactly 50 years later - "This title will be released on May 26, 2017." Also in DISC dated 10/6/1967 they reported on the Jimi Hendrix concert on Sunday 4th June playing his version of Sgt. Pepper. So in reality he had over a week to rehearse it despite what Macca said. Bet he'd been sent a complimentary copy in advance! ^ Oasis are on sale for £5 in Tesco but Beatles DVD is still £10. Shame I can't stand Oasis then. The Beatles 1+ DVD box set is now £16.99 on Amazon, and is no. 21 on their top 100 chart. This is the lowest price I have seen. Still being marketed as Limited Edition. 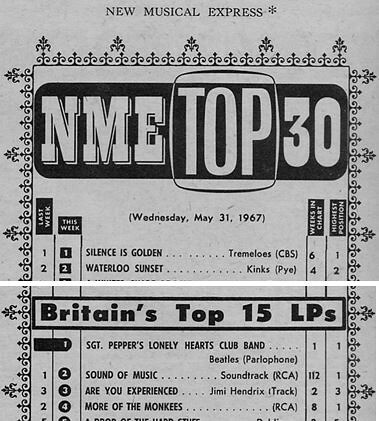 Sgt Pepper’s Lonely Hearts Club Band by the Beatles sold more than 5 million units in the UK. It all started with the 4,811,996 sales claim made by the OCC on their all-time Top 100 published in November 2006. From the very first day, various chart followers including myself seriously questioned this figure. It has been agreed for long that it is a wrong one, inflated by a good 2 million. Yet, in an attempt to maintain their credibility, the OCC has been continuing to go by that figure, strongly refusing to question the said claim and instead adding new sales to that flawed total. It is just one example among many others. After a decade of claims without a single fix, their all-time lists ended up being hugely corrupted. With the BPI automatically certifying records on the back of OCC figures, the historical source for fixing erroneous figures is now corrupted as well. We all do mistakes, myself included. It isn’t that much of an issue – continuing to state an error as a fact is though. That’s why we ain’t gonna do that, highlighting and fixing our own errors rather than hiding them. iTunes promoting Rubber Soul this week (at £6.99) and Wings Band on the run (at £4.99). Only at 623 and 527 respectively on iTunes chart. 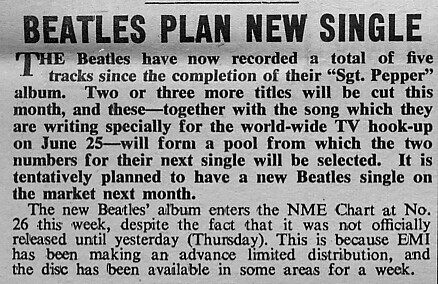 Rubber Soul out on vinyl next Wednesday may boost its chart position. There is an article about Sgt. Pepper in today's Daily Mail.